From Yu-Gi-Oh.jp, and claimed to be in this month’s issue of V Jump. You can only Special Summon 1 card with this card’s name with the way written in its (1) effect. You can only use this card name’s (2) effect once per turn. (1) You can Special Summon this card (from your hand) to your zone a Link Monster points to in Defense Position. (2) If this card is Normal/Special Summoned to a zone a Link Monster points to: You can target 1 “Palladion” card you control and 1 card your opponent controls; destroy them. (2) You can target 1 “Palladion” Link Monster you control; only that monster can attack for the rest of this turn, also any battle damage it inflicts to your opponent from battling a monster is doubled. (2) If a “Palladion” monster(s) you control would be destroyed by battle or card effect, you can banish this card from your GY or your side of the field instead. (2) If this card is Normal/Special Summoned to a zone a Link Monster points to: You can target 1 “Palladion” card in your GY, except “Palladion of the Celestial Bodies”; add it to your hand. (2) You can target 1 “Palladion” Link Monster you control; during this turn, if it attacks a Defense Position monster, inflict piercing battle damage. (3) If an Effect Monster is Special Summoned to a zone this card points to: You can add 1 “Palladion” monster from your Deck to your hand. (1) This card gains ATK equal to the original ATK of the monsters this card points to. (3) Once per turn (Quick Effect): You can Tribute 1 “Palladion” or “World Legacy” monster you control that this card points to, then target 1 face-up card your opponent controls; until the end of the turn, that card’s effects are negated. (1) This card gains ATK equal to the original ATK of the monster(s) it points to. (3) If an Effect Monster is Special Summoned to a zone this card points to: You can add 1 “Palladion” Spell/Trap Card from your Deck to your hand. 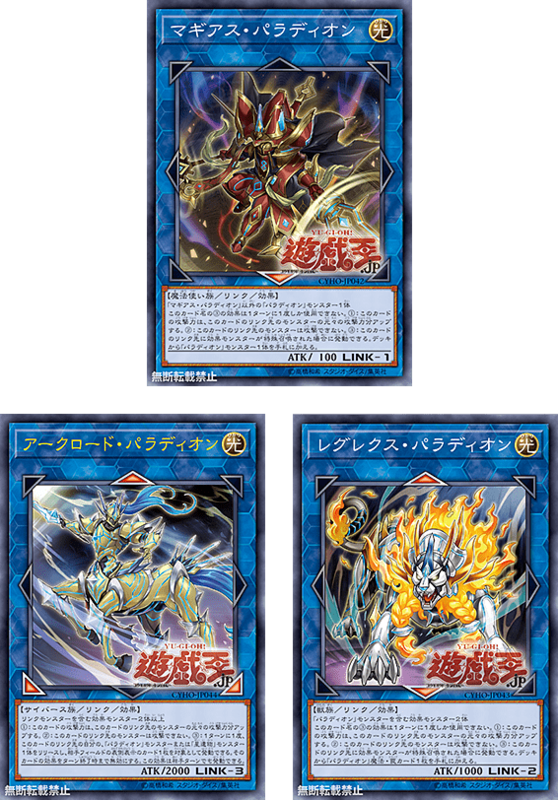 (1) When activated: You can Tribute 1 “Palladion” monster or “World Legacy” monster; Special Summon 1 “Palladion” monster or “World Legacy” monster with a different original name from your Deck or GY. (2) If you control a “Palladion” Link Monster, your opponent cannot target monsters for attacks, except Link Monsters.